Liven up any lackluster space by channeling your inner Warhol and turning an ordinary color or black and white photo into pop art. 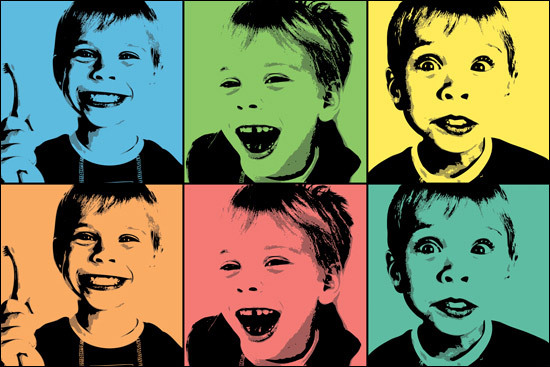 Let Canvas Direct™ modernize your living space by turning images of your loved ones into pop art portraits. Pop art images provide a splash of color on any wall in any room of your home. Looking to create a hip living space for your teenagers? Surprise them by allowing Canvas Direct™ to convert their favorite photo to pop art. Fun photos aren’t just for social networking. All too often, digital images are left unused on your camera or image card. Instead of wasting those memories, choose Canvas Direct™ to duplicate those images by transforming your photo to pop art. Your home is your canvas, so why not personalize your space with these modern works of pop art? Why stop at home? One of the first things customers notice when dining out, shopping, or enjoying local entertainment is what’s on the walls. If you want to capture a mood, why not let Canvas Direct™ digitally enhance photographs taken by a professional photographer by turning them into works of pop art or even creating a pop art collage on canvas? Then, your boring images of coffee cups, wine glasses, or bread baskets come to life by relying on Canvas Direct™ for your photo to pop art needs. What better way to make your business a representation of you, than displaying some of your personal memories in pop art for your patrons to admire? Even a fresh, clean space deserves some color with Canvas Direct’s pop art portrait finish. Canvas Direct™ is here to make any photo a pop art masterpiece by simply clicking the red Order Your Pop Art button to begin your purchase. First, select your pop art style, then select how many panels you want on your pop art print, and lastly upload your image! It’s that simple. So, next time instead of paying too much money for mass produced, poor quality stock prints, add your own art to your home or workspace by choosing Canvas Direct for all of your photo to pop art needs.